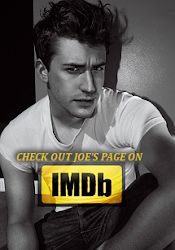 Love Joe Mazzello: Entertainment Tonight to show preview of GI Joe 2 trailer on Monday! Entertainment Tonight to show preview of GI Joe 2 trailer on Monday! It seems that on Monday, we will get a preview of the GI Joe 2 trailer on Entertainment Tonight! Thanks to Shogi over at Hisstank.com, we've learned that they will show a preview of the trailer on Monday's show. It will most likely be a few flashes of some scenes with voice overs from ET talking about the movie. But still, we will get to see NEW footage! This show will air about an hour before the full trailer is released online the same day. If Joe is in the preview, there will be pictures and video right here after it airs! Check here to see what time Entertainment Tonight is on in your area. Don't forget, the FULL TRAILER premieres exclusively on the official movie's UK Facebook page at 7:30pm EST on Monday December 12th! "Coma" TV Pilot to air on March 1st, 2012? Joe to star in new A & E miniseries called "Coma"
OFFICIAL GI JOE RETALIATION TRAILER! The GI Joe Retaliation trailer premieres today! SEE THE GI JOE 2 RETALIATION TRAILER EARLY!